Welcome to the Hotel Academie 4*. 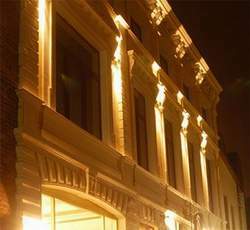 Academie Hotel modern hotel is situated right in the historic “golden triangle” of Bruges itself, just 50 metres from the famous Minnewater (Lake of Love) and the Begijnhof (Beguine Convent). You’ll also find all the other interesting sights of Bruges within walking distance. With Academie Hotel 90 stylish rooms, Academie Hotel offer you all the necessary comforts: air-conditioning, telephone with direct outside line, wake-up service and television with remote control, safety box, fridge and coffee & tea making facilities. All our bathrooms are equipped with both bath and shower and hair dryer. Please note that the entire hotel is subject to a non smoking policy. Due to health and hygiene instructions, pets are not allowed. You can relax in Academie Hotel comfortable bar, in the lovely winter garden or on the stylish garden terrace. Discover the delicious cuisine and delightful shopping right here in the neighbourhood, while leaving your car in the safety and convenience of our underground parking facility. For those arriving by car, by motorcycle or by bicycle, safe and convenient parking is available in our underground parking facility. Academie Hotel offer you all the comforts you’ve come to expect as a modern traveller. Enjoy wireless Internet access in Academie Hotel comfortable lobby or relax with a cocktail or other refreshing beverage in our stylish bar or in the peaceful winter garden.